We do a lot of our homeschool studies sitting at the kitchen table. The table sits by the large windows overlooking the backyard. It is the perfect place to bird watch. Over the past couple days, the kids have researched some of the backyard birds we have spotted this winter. Using the bird themed notebooking pages, they are recording what they have learned. The kids were given a notebooking page for their chosen birds and 3 reference books for their research. The Peterson Field Guide to Eastern Birds has been my bird guide for 20 years. I have my life list recorded inside. It is always in the window seat drawer along with my binoculars. 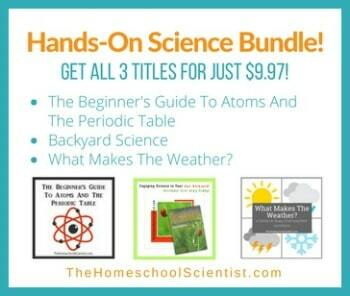 The other two books came with our Nancy Larson Science curriculum last year. Both are great, basic bird books for young learners and those seeking basic bird identification and habit information. Common Birds And Their Songs comes with a CD of bird songs and calls so you can hear what the birds sound like. Learning bird songs is helpful when you can’t get a good look at a bird. Sometimes you can identify it by its song. Birds, Nests, And Eggs is a children’s guide book with beautiful illustrations of birds, nests, and their eggs. The cardinal and the chickadee were easy and fun to draw. The notebooking pages and art turned out so well, we hung them up on the bulletin board. Follow The Homeschool Scientist’s board Bird Study Resources on Pinterest. any notebooking we do is usually for history or science. We have Nature Study journals that the kids keep as an ongoing project. Well, these pictures your kids did are totally AWESOME! Great work. Looks awesome! We generally don’t do notebooking but I would with this! We use notebooking for history and science. Haven’t really done notebooking, but we also do school around a big window to our backyard and watch birds often. This would be awesome! I have, some. My daughter seems to enjoy it when we do. I have never done notebooking but we do our school next to our sliding glass doors and all of my kids love to bird watch! this would be so neat! I have never done notebooking. This would be the perfect first for us. We love birds and have a bird feeder close to the house. We even keep binoculars nearby! We love doing nature notebooks for natural science study. Just getting out there and actually observing all of creation, and recording it in a journal, along with poems, or quotes to tie it all in to make it personal. It’s therapeutic in many ways too! we use notebooking pages for everything! They’re super easy for my 3-hole punch loving heart !! Great post & info – thank you!! Oh, how disappointing! I read at the beginning of the post to keep reading to the end for the “giveaway” and I was so excited to see all the beautiful resources offered for free.. Well, NOT! Right at the end of the post I find out that you have to pay money for it…. So sad. Sorry Beth! There was a giveaway that ended a few days ago. The Bird Notebooking Pages are still a steal at 78 pages for $3.99!